Standard two-dimensional orientation-field-based phase-field models rely on a continuous scalar field to represent crystallographic orientation. 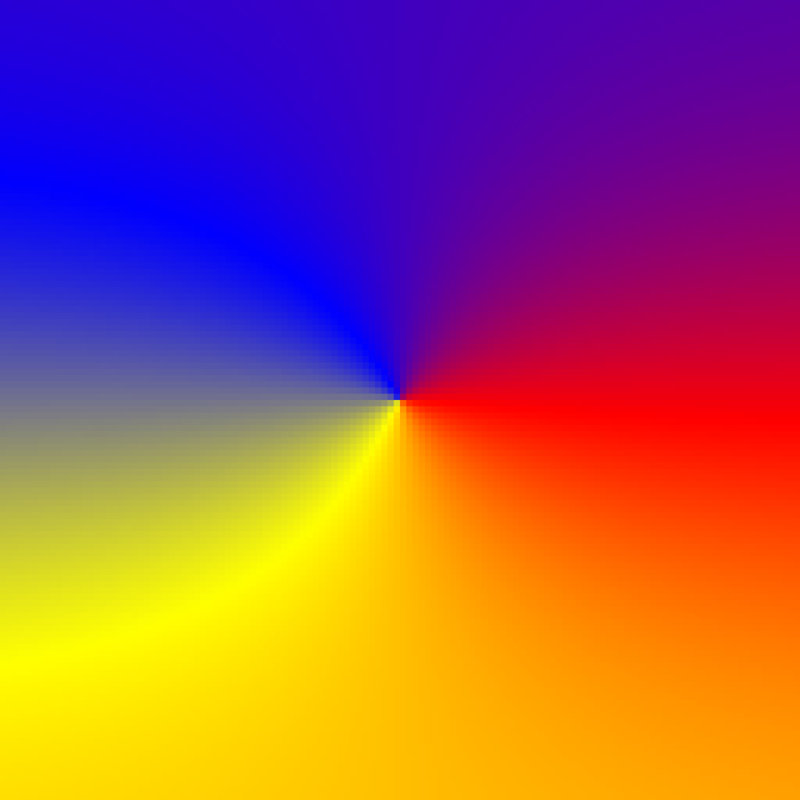 The corresponding order parameter space is the unit circle, which is not simply connected. This topological property has important consequences for the resulting multigrain structures: (i) trijunctions may be singular; (ii) for each pair of grains there exist two different grain boundary solutions that cannot continuously transform to one another; (iii) if both solutions appear along a grain boundary, a topologically stable, singular point defect must exist between them. While (i) can be interpreted in the classical picture of grain boundaries, (ii) and therefore (iii) cannot. In addition, singularities cause difficulties, such as lattice pinning in numerical simulations. To overcome these problems, we propose two formulations of the model. The first is based on a three-component unit vector field, while in the second we utilize a two-component vector field with an additional potential. In both cases, the additional degree of freedom introduced makes the order parameter space simply connected, which removes the topological stability of these defects. In the literature, contradictory results have been published regarding the form of the limiting (long-time) grain size distribution (LGSD) that characterizes the late stage grain coarsening in two-dimensional and quasi-two-dimensional polycrystalline systems. While experiments and the phase-field crystal (PFC) model (a simple dynamical density functional theory) indicate a lognormal distribution, other works including theoretical studies based on conventional phase-field simulations that rely on coarse grained fields, like the multi-phase-field (MPF) and orientation field (OF) models, yield significantly different distributions. In a recent work, we have shown that the coarse grained phase-field models (whether MPF or OF) yield very similar limiting size distributions that seem to differ from the theoretical predictions. Herein, we revisit this problem, and demonstrate in the case of OF models [by R. Kobayashi et al., Physica D 140, 141 (2000) and H. Henry et al. Phys. Rev. B 86, 054117 (2012)] that an insufficient resolution of the small angle grain boundaries leads to a lognormal distribution close to those seen in the experiments and the molecular scale PFC simulations. Our work indicates, furthermore, that the LGSD is critically sensitive to the details of the evaluation process, and raises the possibility that the differences among the LGSD results from different sources may originate from differences in the detection of small angle grain boundaries. We compare two versions of the phase-field theory for polycrystalline solidification, both relying on the concept of orientation fields: one by Kobayashi et al. [Physica D 140 (2000) 141] and the other by Henry et al. [Phys. Rev. B 86 (2012) 054117]. 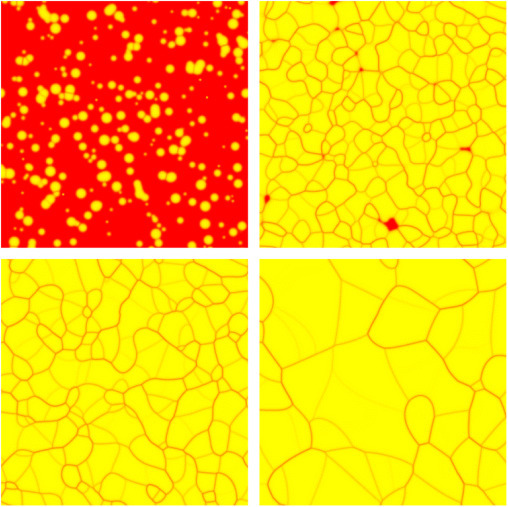 Setting the model parameters so that the grain boundary energies and the time scale of grain growth are comparable in the two models, we first study the grain coarsening process including the limiting grain size distribution, and compare the results to those from experiments on thin films, to the models of Hillert, and Mullins, and to predictions by multiphase-field theories. Next, following earlier work by Gránásy et al. [Phys. Rev. Lett. 88 (2002) 206105; Phys. Rev. E 72 (2005) 011605], we extend the orientation field to the liquid state, where the orientation field is made to fluctuate in time and space, and employ the model for describing of multi-dendritic solidification, and polycrystalline growth, including the formation of “dizzy” dendrites disordered via the interaction with foreign particles.